The Original Grandpère Vineyard, also known as Vineyard 1869, is the oldest documented Zinfandel vineyard in America dating back to the 1860's. In 2016, the California State Fair named it Vineyard of the Year. Still in production today, only four wineries are privileged enough to receive fruit from this vineyard. Three of them are here in Amador County; Andis Wines, Scott Harvey Wines, and Vino Noceto. Over the course of four days, guests to Amador County will have a chance to taste, sip, and explore this heralded Zinfandel vineyard. Feast - The weekend kicks off Friday, January 12th at the award-winning Taste Restaurant, where a special Prix-Fix menu will highlight pairings with the OGP/Vineyard 1869 Zinfandel offerings from Andis Wines, Scott Harvey Wines, and Vino Noceto. To make reservations, please contact Taste Restaurant directly at (209) 245-3463. This dinner will be offered Friday-Sunday, January 12-14. (Dinner Separate from ticket price below). 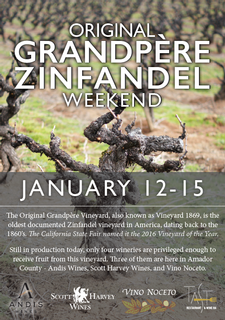 Unique Tastings – Saturday-Monday, January 13-15th, each winery will be offering current and library vintage tastings of their OGP/Vineyard 1869 Zinfandel, paired with small bites. Passport tickets can be purchased in advance or in-person “day-of” at all three wineries for $30. The passport ticket will grant you access to all three locations, plus a 15% discount on “OGP” Zinfandel purchases for the weekend. Vineyard Tours – Saturday Jan. 13th & Sunday Jan. 14th you’ll have the chance to walk amongst the ancient vines themselves – Saturday with winemaker Rusty Folena of Vino Noceto and Sunday, with past proprietor & winemaker, Scott Harvey. Tours will meet at the vineyard at 10am, weather permitting. The tasting passport and tour package is $40 per person. Reservations are required, as space is limited to 24 people per day. The vineyard tour is located at 12400 Steiner Road in Plymouth.